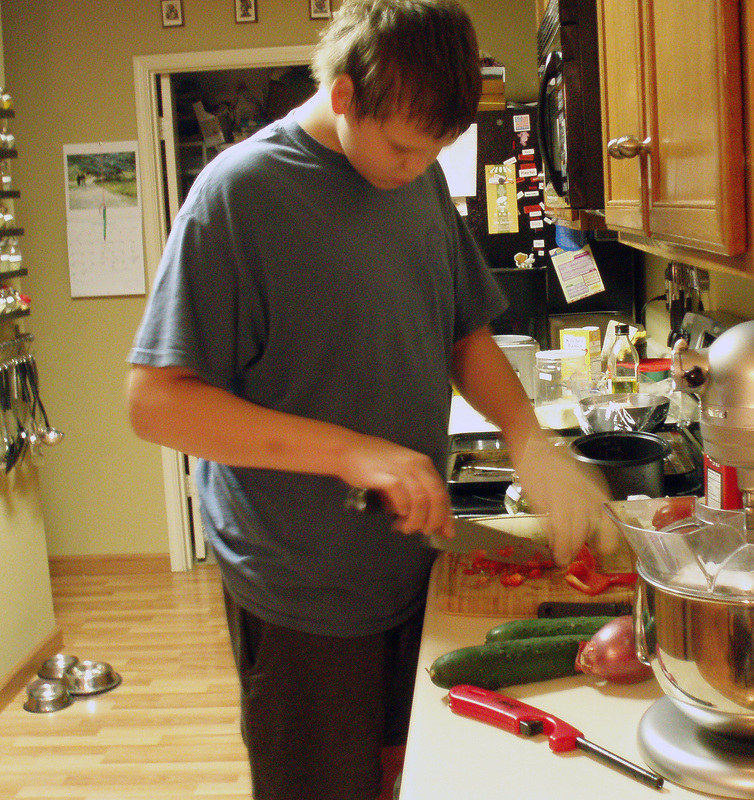 Brandan, the ever-adventurous one, was determined to make something with swordfish. Not that he (or any of us, for that matter) have eaten swordfish before – he just wanted to try it. 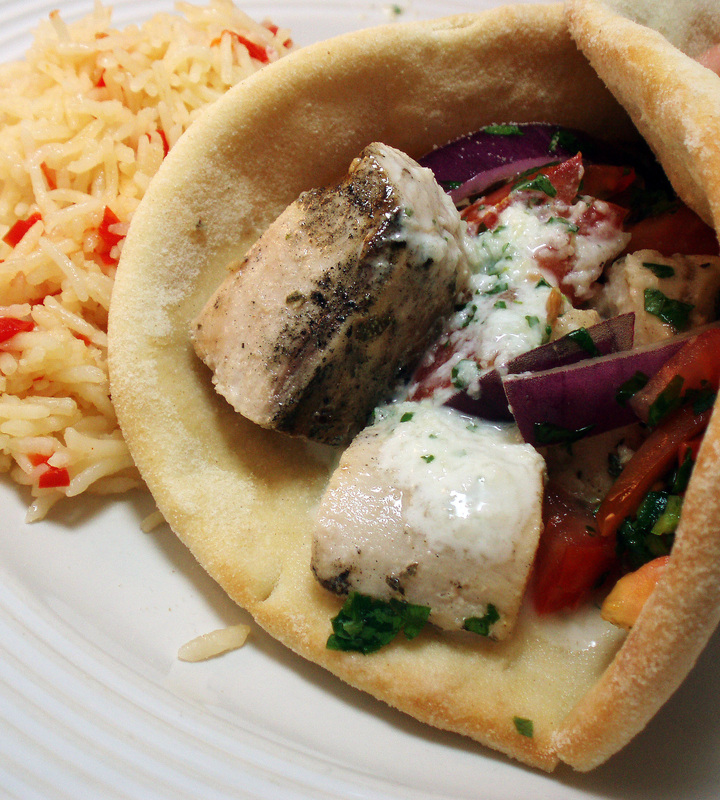 Since the country he chose was Greece, we found a recipe for swordfish souvlaki. With the mixture of fresh flavors and the ease of the grill, we figured this was a winner. If using pita breads or Udi’s pizza crusts, wrap in foil and place in a warm oven (200 degrees). Preheat grill. In a bowl, toss swordfish with lemon juice, oregano, salt and pepper and marinate, chilled, for 15 minutes. Grate the cucumber. Wrap in a kitchen towel and squeeze to extract liquid. In a small bowl, stir together cucumber, yogurt, mint, garlic paste, and salt and pepper to taste. In another bowl combine tomatoes, onion, parsley, and salt and pepper to taste. Thread fish on skewers, and grill on oiled grates, turning once, until just cooked through, about 8 minutes. Remove fish from skewers. Holiday Food Fest – Winner of Giveaway! Just a quick word to say thank you to everyone that participated in this week’s Holiday Food Fest! So many lovely, scrumptious dishes were submitted – which only served to give me even more ideas for the upcoming holiday. And a big thank you to Amy at Simply Sugar and Gluten-Free for putting on this amazing event. Now, to the fun part! The winner, chosen by random.org, is Saveur at TasteSpace. Congrats! Please send me your mailing information so we can get your prize out to you! Don’t forget, next week’s Holiday Food Fest will be hosted by Phoebe at Cents to Get Debt Free. Be sure and link up your favorite holiday edible gifts. (And send some my way, if you have any extra. Okay, just kidding. Kind of.) Phoebe will be giving away a Digital Precision Pro Scale, so be sure and link up! This Thanksgiving, don’t throw away those turkey leftovers! Remember the meat from those turkey wings and drumsticks I used the other day to make gluten-free turkey gravy? All that meat didn’t go to waste – it was used to make a delicious, warming turkey chili! I actually purchase a larger turkey than necessary for Thanksgiving each year. I love the leftovers. 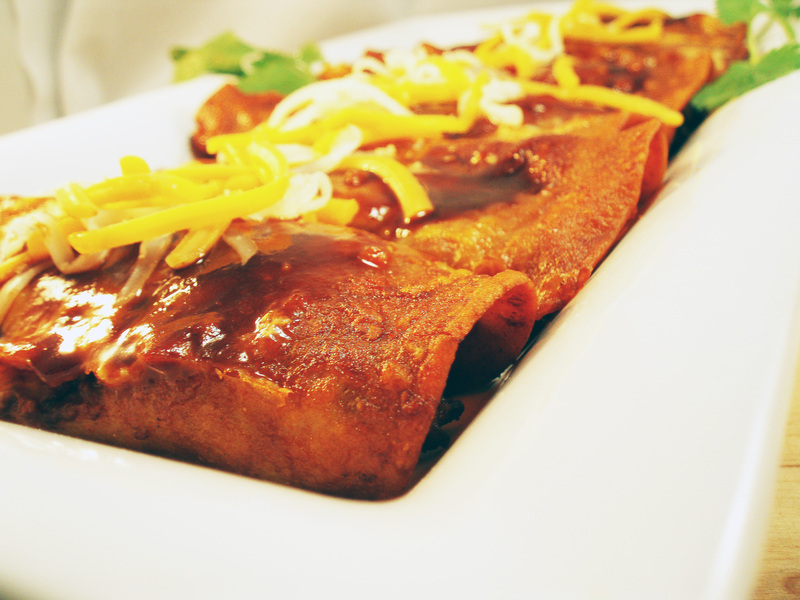 They make great filling for enchiladas, sandwiches, or even taste good eaten cold, straight from the fridge, late at night. Not that I would know or anything. But now, the leftovers star in a spicy, flavorful chili. Or you could add crushed tortilla chips and call it tortilla soup. Whatever you call it doesn’t matter. What matters is that you try it! Of course, you don’t have to wait for Thanksgiving to make a chili like this. You can use any leftover chicken or turkey, or you can even purchase a rotisserie chicken from the grocery store and use it, if that’s your thing. It’ll all taste delicious in this soup. Heck, you could even go meatless, and use vegetable stock and add some cubed sweet potatoes or squash, and make a delicious vegetarian soup. It all sounds yummy to me. If you can’t find tomatillos, you can substitute a 16-20 oz jar of bottled salsa verde/tomatillo salsa. Tomatillos are plentiful around here in Texas – but the cheapest ones are usually at the Latin groceries. Place the tomatillos and jalapenos cut-side down on a foil-lined baking sheet. Scatter onions and garlic around tomatillos and jalapenos. Place under broiler for 5-7 minutes or until skins on tomatillos blacken. Remove, and when cool, pour tomatillos, jalapenos, onion and garlic, including any juices, into a food processor. Pulse until well blended. Heat a large stockpot to medium heat and add tomatillo mixture and chipotle pepper. Stur around for a minute or two, and add turkey, beans, broth, beer, tomatoes and seasonings. Bring to a boil, and reduce to a simmer. Allow to simmer, stirring occasionally, for 20-30 minutes to allow flavors to blend. Immediately before serving, taste and adjust salt and pepper seasonings as necessary, and stir in most of the cilantro, reserving a bit to use as garnish. Optional: Top with sour cream and cheese. It’s been a while since we’ve had a Kids in the Kitchen post. The last time our kids were over, I was consumed with the making of stew, so all we could manage that night for dinner was frozen pizza. (Yes, frozen pizza does grace the Tasty Eats At Home kitchen from time to time…) This weekend, Kids in the Kitchen resumed with Brittany’s dish. She chose China – and wanted to make orange chicken with steamed rice. Orange chicken is actually one of my favorite take-out Chinese dishes, but according to Bee at Rasa Malaysia, it’s an actual, authentic Chinese dish of Hunan origin. I have made Bee’s recipe for orange chicken before, so I knew just how delicious this recipe was. However, this time around, I needed to convert the recipe to gluten-free. I haven’t done a lot of breading and frying since I’ve gone gluten-free, so I haven’t had a ton of experience in substituting for the flour. I love fried food, in moderation, but honestly, it’s just not the healthiest choice for dinner. I chose to use a mixture of sorghum flour (one of my “go-to” gluten-free flours in baking lately) and masa harina. The crust on the chicken was beautifully crisp, yet delicate. Definitely considering using this batter recipe for other fried foods in the future! Now I’m dreaming of onion rings, fried shrimp…all of these wonderful things I shouldn’t be eating! Anyway, back to the orange chicken. This is a delicious recipe. It’s not sticky and gooey like Chinese take-out restaurants. It’s flavorful, lightly spicy, and not loaded with sodium – my other complaint with take-out. Brittany definitely enjoyed it (and enjoyed making it!) We’ll definitely be making this again. Mix all orange sauce ingredients together and set aside. Mix frying batter, and dip the chicken pieces into the batter. Heat up a pot/wok of cooking oil to about 350 degrees, enough to deep-fry the chicken. (I used my cast iron dutch oven and filled it about halfway with oil, although you could probably get by with less.) Drop the chicken pieces into the oil and deep fry until golden brown and crispy. Transfer them to a plate lined with paper towels. In a wok, add 2 t cooking oil and turn on to medium heat. Drain the chiles, and add to the oil. Toss around until you can smell the spicy aroma, about a minute or two. Add the sauce mixture and bring to a bubble, stirring occasionally. Once the sauce starts to thicken, add the chicken, and stir around until warmed through and coated with sauce. Serve with steamed rice and a steamed vegetable, such as broccoli. Liz at Hoosier Homemade is hosting Fall Desserts this week for Holiday Food Fest. Be sure to check out her blog and link up your favorite fall dessert! She’s giving away a Pampered Chef Pie & Tart Cookbook and a cool candle. 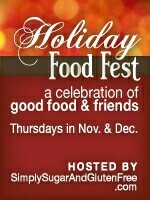 Stay tuned, for next week, I will be hosting Fall Dishes for Holiday Food Fest! Be sure and check back, because there will be another chance at a giveaway! Butter and sugar 4 4-ounce ramekins. Preheat the oven to 400 degrees. Peel the bananas, and puree in a food processor until smooth. In a small saucepan, bring water and the 1/3 cup of sugar to a boil. Simmer 4 minutes or until the sugar has dissolved. Add banana puree, cornstarch, and cinnamon to sugar syrup, and stir until incorporated. Set aside to cool completely. (this is important – if you rush it and the mixture is still hot, it won’t fold into the egg whites correctly.) In a stainless steel bowl, beat egg whites and salt until foamy. Add remaining tablespoon of sugar and beat to soft peaks. Fold cooled banana puree into egg white mixture. Pour into ramekins and place ramekins on a baking sheet. Place baking sheet in oven and immediately turn the temperature down to 375 degrees. Bake for 10-12 minutes, or until puffed up and browned. Don’t open the oven to peek! If you must look (and I always want to! ), use your oven light and peer through the window. If you don’t have one, trust your timer. Serve immediately.